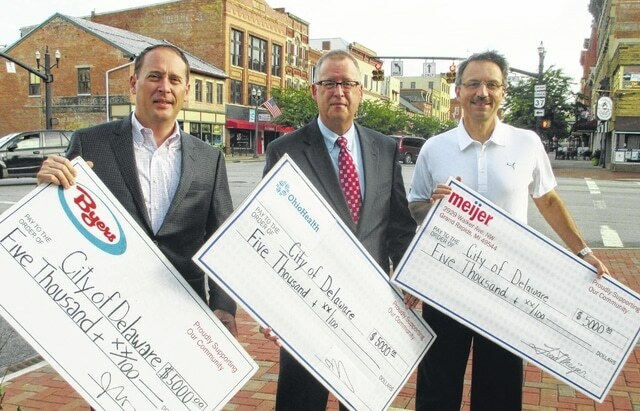 From left, Byers vice president George B. Kauffman, OhioHealth Dublin Methodist Hospital and Grady Memorial Hospital President Steve Bunyard, and Delaware Meijer store director Rod Cline are pictured with their checks at City Hall. Byers, Meijer and OhioHealth each renewed fireworks pledges: Byers will be the presenting sponsor, Meijer will be the grand finale sponsor, and OhioHealth will be the community spirit sponsor. The city of Delaware has announced that Byers Auto Group, Meijer and OhioHealth will be the main sponsors of the city’s July 4 fireworks show. Byers vice president George B. Kauffman said the Byers family looks forward to the event every year. “We are happy to help Delaware celebrate our nation’s birthday and bring people together to connect and celebrate their community spirit,” Kauffman said. The city reached its $25,000 fundraising goal for the event in pledges or donations earlier this month, thanks to the $5,000 pledges from Byers, Meijer and OhioHealth. City officials said Byers will be the presenting sponsor, Meijer will be the grand finale sponsor, and OhioHealth will be the community spirit sponsor. “Delaware deserves a first-class fireworks display on Independence Day and we can’t wait to celebrate alongside our friends and neighbors,” said Rod Cline, store director at the Delaware Meijer. “For OhioHealth, this holiday is particularly meaningful. It gives us time to focus on our families and enjoy the day,” said OhioHealth Dublin Methodist Hospital and Grady Memorial Hospital President Steve Bunyard. Just like previous years, the Ohio Wesleyan University athletic fields along South Henry Street, between Wilmer Street and Olentangy Avenue, will all be available as public viewing areas. Other supporters of the show include JEGS Automotive, the Delaware Fraternal Order of Eagles, American Structurepoint, CT Consultants, Scioto Energy, PPG and the Delaware County Bank and Trust. The city estimates 20,000 spectators will come downtown to view the fireworks, with thousands more staked out in nearby areas. The day’s events will begin with the annual July 4 parade at 1 p.m. The Ohio Machine professional lacrosse team will host the Rochester Rattlers at 4 pm. at Ohio Wesleyan University’s Selby Stadium. Ticket information is available at theohiomachine.com. At 7:30 p.m., the Central Ohio Symphony will perform an outdoor concert at Phillips Glen on Ohio Wesleyan’s campus. Finally the fireworks will close out the event at 10 p.m. The city reports parking at Selby Stadium will be open for Ohio Machine season ticket-holders and handicapped parking for Ohio Machine season ticket-holders at Phillips Hall. Symphony goers will also be permitted to park at Phillips Hall. There will be additional parking at the Schimmel/Conrades Science Center, Meek Aquatics and Recreation Center, and Margaret Sagan softball field. Several streets throughout the city will be closed intermittently to accommodate the parade or heavy pedestrian traffic. A complete list of street closures can be found on the city’s website.